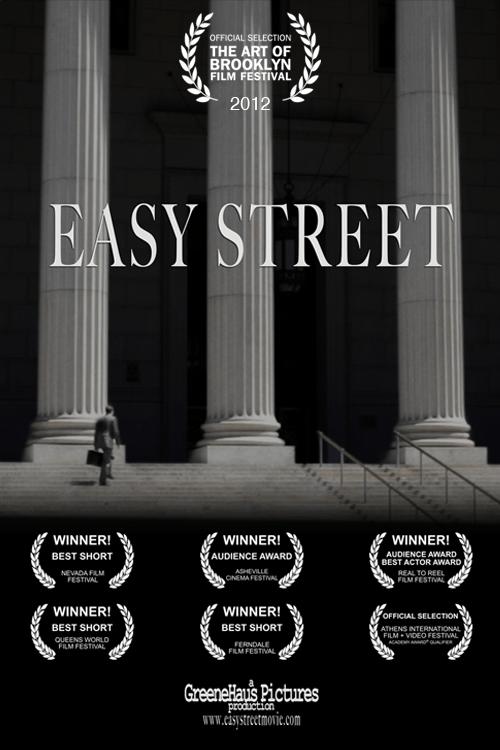 Review Fix chats with director/writer/editor Russell Greene who discusses his film “Easy Street,” set for at a run at this year’s summer screening session of the Queens World Film Festival. Russell Greene: It was a reaction to seeing so many politicians I admired have spectacular downfalls—Spitzer, Edwards, Weiner, etc. I envisioned a scenario where you could be a fly on the wall at a crucial moral moment early in a career like that. Also, to explore an intense event in our lives that I hadn’t seen on film—an interview for The Big Job. Greene: Securing realistic locations and props on a limited budget. Greene: As a snapshot of the political environment in post 9/11 government and politics—and for the silly jokes. Greene: Of the 40+ festivals in which the film screened, QWFF was right at the top of the list. Everyone was so accommodating and supportive—and the amazing thing is that 4 years later they still support me and the film. That is truly unique. Greene: Currently, a film I edited called The Witness is in theaters (including in Kew Gardens) about an iconic murder in Queens. I’m editing a film called Tribal Justice about Native American tribal judicial systems directed by Anne Makepeace. Then I will be starting an edit on a doc about the Blue Note jazz label directed by Sophie Huber. I hope to shoot another narrative short in 2017.